Back in August, we catered for a small dinner party for 20 guests in a beautiful converted barn in the grounds of our clients home near Reepham. 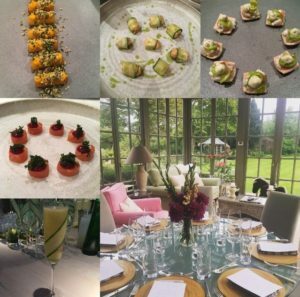 The night started with some delicious Socius drinking snacks, including a new canape to hit our menu 'Seabass tartare, apple, cucumber, fennel' which went down a storm, accompanied by Champagne. 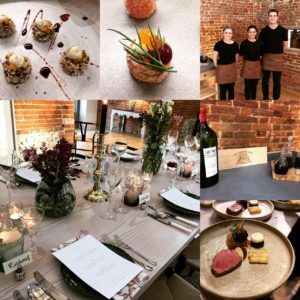 Guests then sat down to a three course dinner starting with a duo of beef main course and finishing with a selection of Norfolk cheeses, accompanied by Dan's homemade chutney and renowned thyme and fennel seed focaccia. Over the bank holiday weekend, Dan was tasked with the impossible - cook two dinners with absolutely no butter in sight! We had to think out-of-the-box to create the weekend's menus as the client asked for a completely vegan dining experience. Guests were blown away on both evenings by the choice and different use of ingredients and couldn't believe the dishes they were eating were actually vegan. Highlights of the weekend included a drinking snack of soy & liquorice pickled crispy mushrooms and our very own vegan Socius chocolate bar with passion fruit, lime and coconut. Natalie was also busy in the kitchen knocking up some Socius cocktails - a favourite of the weekend was our passion fruit and chilli margarita, a fruity, spicy twist on the classic. Both evenings were a huge success and finished with the team being invited into the dining room for a round of applause and vegan banter! Our biggest event so far with 150 guests coming together to celebrate an 18th/21st birthday party. The evening kicked off with a pimms reception accompanied by some of our crowd pleasing drinking snacks. The biggest hit of the night was the main course - 'beef and chips' - Dan and his team braised and rolled 75 beef cheeks low and slow for 12 hours in the most amazing sticky stock of red wine, herbs, aromatics and top secret ingredients. We served this alongside triple cooked chips, onion puree, crispy shallots, pickles and watercress and it went down an absolute storm! Never have we had so many guests come into the kitchen to comment on the food! Our amazing Socius waiting team worked tirelessly into the night, with some even having a boogie with the guests! We should also take this opportunity to congratulate our newly appointed head event waiter, Mr. T Read! The end of September saw a number of firsts for Socius - our first wedding and the first time we've split the team for two events on one weekend! Dan was over in Northampton in a beautiful prestigious venue cooking for an intimate wedding of fifty. Natalie was over at the amazing Aynhoe Park in Banbury (if you've not heard of it, google it now, it's incredible!) managing a wedding for 140 guests. 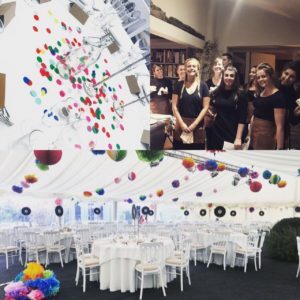 This was one of our 'wedding planning' jobs, and Natalie had been working with the bride and groom for over a year, helping plan and organise their special day - and what an amazing day it was! 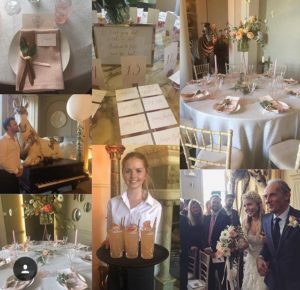 Natalie worked alongside 15 of our amazing Socius waiting team to deliver a day to remember. "Thank you so much for everything this weekend. We literally had the time of our lives and couldn't have done it without your amazing help. You've been such a dream to work with and make our ideas a reality - I can't thank you enough.."
I have 18 months to plan my 70 birthday party, so looking forward to making plans.